Adult classes are available for beginning (Level I) or more advanced (Level II) students. Students learn the basics (centering, opening, pulling, shaping) in these 7 week courses. Instruction includes handbuilding and decorating techniques for inquisitive learners. You will also be introduced to the variety and uses of studio glazes. Classes include instructional demonstrations and ample one-on-one guidance. Fee includes 25 lb. of clay. These classes have no set projects. Children consistently tell us that what is most important to them is the opportunity to make what they want. We are proud of our ability to encourage children to explore and discover their own creativity. In our supportive environment, each child has unlimited access to the potter’s wheels. Teens typically direct their own activity. We provide instruction and guidance but do not assign projects. Class size is kept small enough to allow each student access to a potter’s wheel. A 25 lb. bag of clay, glazes, and firing are included in the fee, tools are extra. Teens also have free use of the studio during non-class hours. Throughout the year, Vermont Clay & Tile presents special classes. Whether reflecting the season (e.g., Think Spring! Pots for Growing Things last May) or venturing into new areas of expression (e.g., Portrait Sculpture – Modeling A Likeness In Clay), all levels of students are welcome. Are you just visiting the area, have limited time, or simply want a taste of working with clay? We offer special private lessons with a professional instructor who will help you make a pot on the potter’s wheel or construct one by hand. Lessons include two hours of instruction and five pounds of clay and firing (additional clay is available). We can even ship your finished piece to you. Please call for rates. GROUPS: Our professional staff can design classes for homeschool groups as well as public and private groups, at the Vermont Clay & Tile, or with our Claymobile. Studio space may be rented by the day, week, or month. This is an excellent option for people who don’t need instruction but would like to use the space and equipment. Rental includes a designated shelf area, firing, glazing, and a discount on clay, as well as full use of the facilities and equipment during regular open hours. An Open Studio rental option provides you with access for over 130 hours per month, including, daytime, evening, and weekend hours. To Register call the Vermont Clay & Tile office to request a current class calendar, or to register for a class. Registrations are accepted in the order received. Full tuition must be paid 24 hours in advance of the first class; a $5 fee will be charged for late enrollment. Tuition includes a non-refundable registration fee of $10. Cost of tools for adult and teen classes is extra. Send the Registration Form with payment (check or credit card) to the address at the bottom of the form. All students are required to pay an annual membership fee; if you are not currently a member, please include the fee with your registration. The Vermont Clay & Tile reserves the right to change instructors or cancel courses, if necessary. Classes cancelled due to inclement weather or instructor illness will be rescheduled. Refunds, less the $10 non-refundable registration fee, will be given to students withdrawing from a class one week prior to the scheduled start date. Otherwise, refunds are given only when a class is cancelled by the Studio. 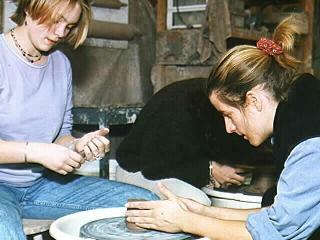 Scholarships – An adult, a teen, and a child scholarship are awarded each session for pottery classes. Applications may be obtained by contacting us. Visiting artists are invited to each session to conduct workshops, demonstrations, slide presentations, or lectures. Workshops supplement the education provided by the faculty, as well as provide diversity, excitement and the opportunity for professional development. Each workshop lends insight about a successful artist’s inspirations, techniques and creative processes. See the Calendar of Events for current schedule of demonstrations.